Colonel H. B. Granbury, born March 1, 1831 in Copiah County, Mississippi, commanded the 7th Texas Infantry during the Battle of Raymond. Granbury's service to the Confederate Army began as early as 1861 when he organized the Waco Guards in Waco Texas. Three years later, having achieved the rank of Brigadier General, he was killed during the Battle of Franklin. Before the outbreak of the war, Granbury lived in Waco, Texas, where he served as chief justice of McLennan County. He was a graduate of Mississippi's prestigious Oakland College located near the river town of Rodney, Mississippi. In the 1850s, after moving to Texas, he was admitted to the Texas Bar. On March 31, 1858, he married Fannie Sims of Waco; they had no children. In November of 1861, at Hopkinsville, Kentucky, the Texas Volunteer regiment elected Granbury as major. On February 15, 1862, he was captured with his command at the Battle of Fort Donelson. Under Grant's terms of surrender, the Confederates were shipped north and taken as prisoners of war. The enlisted men were sent to Johnson Island Prison, Lake Erie, while the officers were held at Warren Prison in Boston Harbor. Other Confederate officers held at Warren Prison along with Major Granbury were: Lt. Col. Randal McGavock, 10th Tennessee; Major W. Grace, 10th Tennessee; Col. John Gregg, 7th Texas Infantry; Col. R. Farquharson, 41st Tennessee; Col. C. A. Sugg, 50th Tennessee and Brig. Gen. L. Tilghman, C.S.A. While in prison, Major Granbury signed the autograph album of Captain John R. Tower, 8th Georgia Volunteer Infantry. His signature reads, "H. B. Granbury, Maj. Texas Volunteers, Waco, Texas." All of these officers were paroled in 1862 as a part of an officer's exchange. In order to be near her husband, Fannie traveled to Boston where they hoped he would be paroled. Instead, Granbury was taken by boat to Fort Warren Prison, 6 miles out in Boston Harbor, leaving Fannie behind in a city of strangers. Dr. Charles MacGill, a political prisoner from Maryland and one of Granbury's prison mates, made provisions to send Fannie to Hagerstown, Maryland, to live with his wife and family. During the five months that Granbury was held in Fort Warren Prison, Fannie remained in the MacGill home. During this time, Fannie became ill and was scheduled to undergo surgery at a hospital in Baltimore. Granbury was given an early parole in order to meet his wife in Baltimore and to attend the surgery. The parole is documented in a dispatch from L. Thomas, Adjutant-General, U. S. A., dated July 29, 1862: "The eight or nine prisoners referred to and those who have taken the oath of allegiance will not be sent to Fort Monroe; Parole Major Granbury, of Texas, that he may attend his wife while having a surgical operation performed at Baltimore." When the Granbury's visited the doctor in Baltimore, they found that Fannie was suffering from advanced ovarian cancer and nothing could be done for her condition. She remained in the MacGill home while Granbury returned South to resume his war efforts. Following his exchange from prison, Granbury was stationed in northern Mississippi as a part of Maxy's Brigade and was promoted to the rank of colonel. He was also assigned to Texas on recruiting duty. In October of 1863, he traveled to Baltimore and brought Fannie home to Tuscaloosa, Alabama where she remained in the home of her father. Near the end of her illness, she was taken to Providence Infirmary, Mobile, Alabama, where she passed away on March 20, 1863. Her obituary appeared in the Mobile Advertiser and Register on March 21; "Died on yesterday, at 11:00 A.M., Mrs. Fannie Granbury, aged 25 years. Wife of Col. H. B. Granbury, 7th Regiment Texas Infantry. The funeral will take place from the Providence Infirmary, at 3 o'clock P.M. TODAY." No record has been found to confirm that Col. Granbury left his regiment to attend the funeral. Fannie was buried in Magnolia Cemetery in a plot donated by a friend. Since there was no headstone, Fannie's burial site was lost to history. 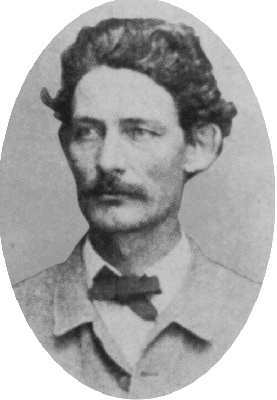 Col. Granbury resumed his war efforts leaving for Port Hudson, Louisiana, then on to Raymond, Mississippi. Colonel Granbury had only been widowed two months when he fought in the Battle of Raymond. After the Confederate defeat at the Battle of Raymond, he continued as commander of the 7th Texas and moved on to fight in the Battle of Chickamauga where he was slightly wounded. On Feb. 29, 1864, following a brilliant performance in the Chattanooga-Ringgold Campaign, Granbury was commissioned brigadier general. Nine months later, while commanding Granbury's Brigade, he was killed at the Battle of Franklin. Brig. Gen. Granbury was first buried near Franklin, Tennessee, then reinterred in Ashwood's Cemetery belonging to St. John's Episcopal Church. On Nov. 30, 1893, his remains were removed to Granbury, Texas, a town named in his honor. Today, having found the burial site of Fannie Granbury, a memorial headstone has been set in her memory next to her husband in the Granbury Cemetery. The stone reads: "Wife of Hiram B. Granbury, Fannie Sims Granbury, Born 1838, Died March 20, 1863, Married 1858, Waco, Tx., Buried in an Unmarked Grave, Magnolia Cemetery, Mobile, Al. Thanks to Rebecca Drake, Historian, Mary E. Johnson, Researcher, Jane Embrose, Family Descendant, This Memorial Stone Placed by the Hood County Historical Society, 2003."